Theme Options images assets url fix. VC Images Shortcode - Open in New Window fix. WooCommerce - Product Add to Cart AJAX fix. Visual Composer update to version 4.11.2.1 - deactivate before Update! Visual Composer update to version 4.11.2 - deactivate before Update! WooCommerce products list - images displaying crop rebuild. Revolution Slider update to version 4.6.93 - export all yours sliders before update! VC_Row - Min Height and Vertical Align code rebuild. Portfolio custom categories selection fix. Portfolio quick view button fix. Added demo-content.zip file to theme package. Welcome to Elise WordPress Theme Docs. You will find here the all necessary information how to use this Theme. If you have any questions feel free to send a message via this contact form. To install this Theme you must have working version of WordPress 3.6 or higher. If you need help installing WordPress follow the instructions in official WordPress Codex. Elise Theme Folder – contains "elise.zip" which is main installable zip file of Elise Theme and "elise-child.zip" - Elise Child Theme. Information about child themes you will find here. 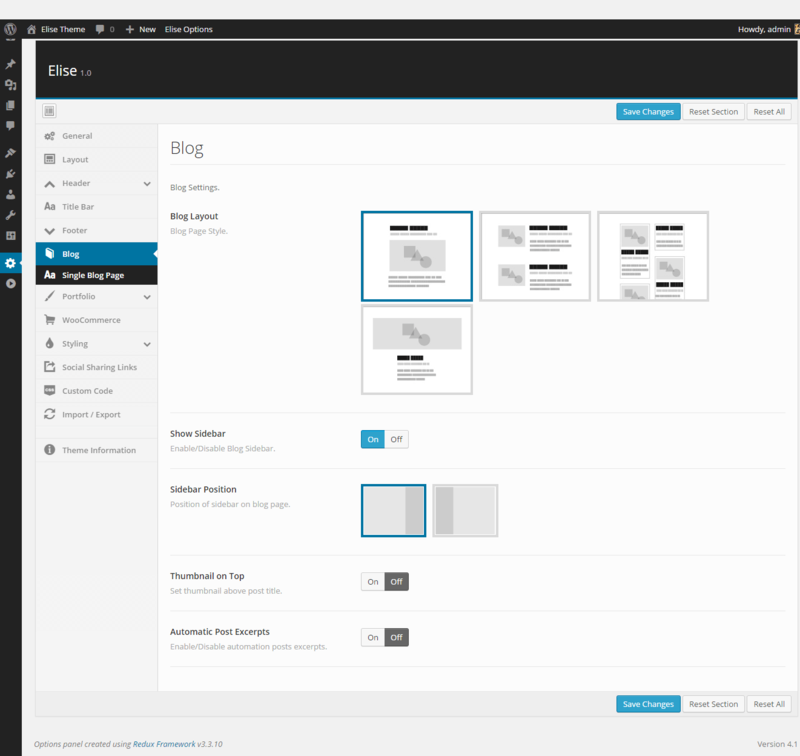 Docs Folder – contains Elise Theme, Revolution Slider and WPBakery Visual Composer documentation. Psd Folder – contains layered Photoshop PSD files. Licensing Folder – GPL Licensing informations. You can install Elise Theme in two ways. Directly through WordPress (easier and faster way) or via FTP. 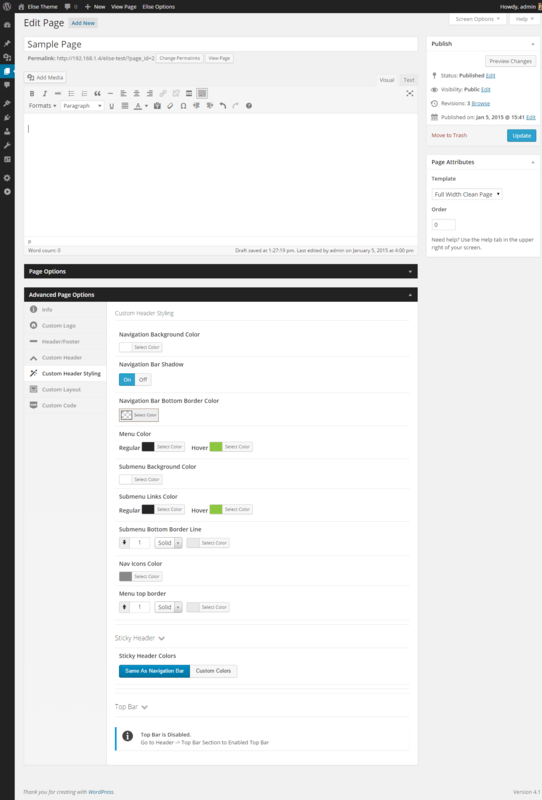 In WordPress Admin Panel go to Apperance -> Themes. Click Add New Button, then click Upload Theme. Wait until installation process will be done. Go to After Installation Process. Sometimes you might have "max upload filesize" problem. To solve this problem follow instructions in this article. Unzip elise.zip file into elise folder. Make sure that in elise folder you don't have any other subfolder – only theme files and subfolders. Upload elise folder into themes. Wait until you have uploaded all theme files. This step is very important!. Go to Theme Options panel and click Save Changes button. This step will save all theme option variables into database. Last step is to create main menu area. Go to Appearance -> Menus then create main menu with your menu name (e.g. Main Menu) and click Save Menu. After that assign your Main Menu to "Main Navigation" location. It's also recommended to assign Main Menu to Full Screen/Mobile Navigation. Elise includes a few recommended plugins, fully styled and 100% compatible with theme. See list of all plugins below. 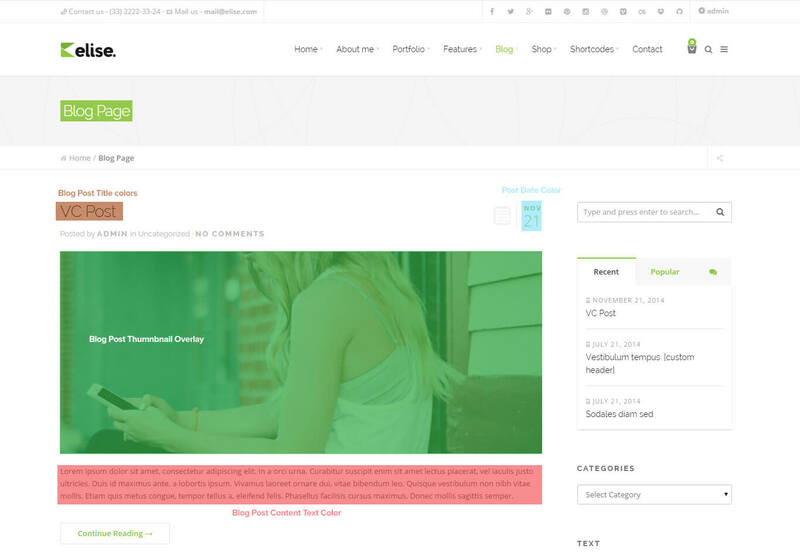 WPBakery Visual Composer – required plugin – Drag and drop page builder for WordPress. 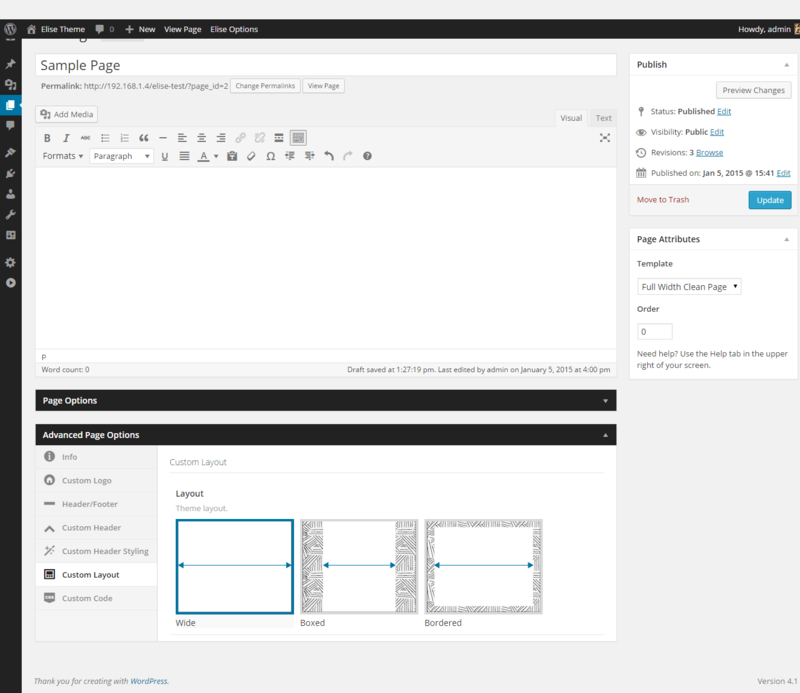 Take full control over your WordPress site, build any layout you can imagine – no programming knowledge required. 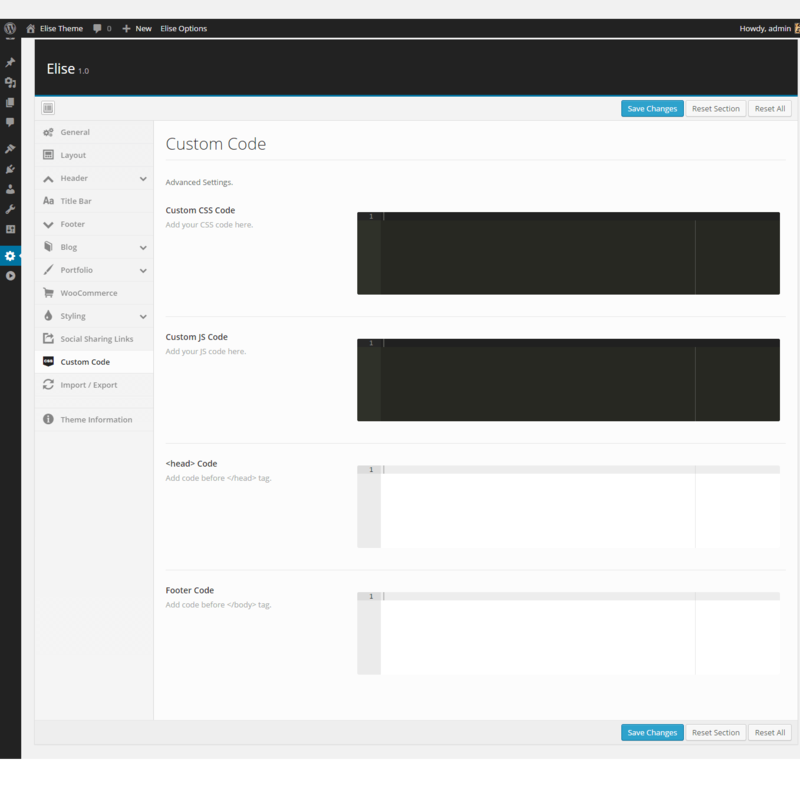 Plugin includes all shortcodes, created and tailored specially for Elise Theme. 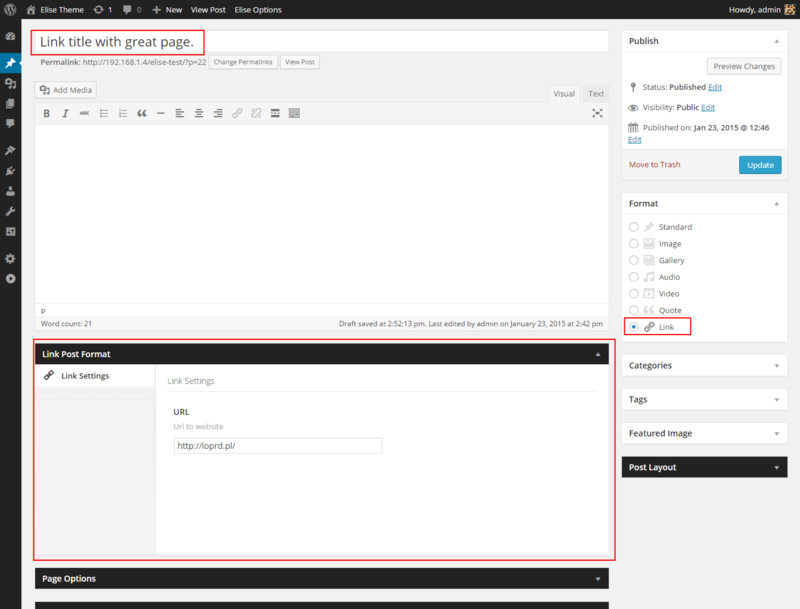 Read more about using Page Builder and shortcodes here. 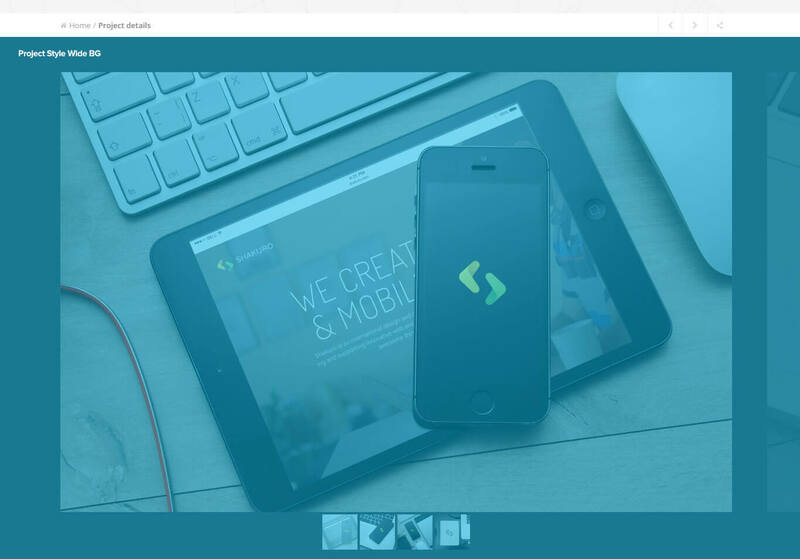 Revolution Slider – Revolution Slider - Premium responsive slider. 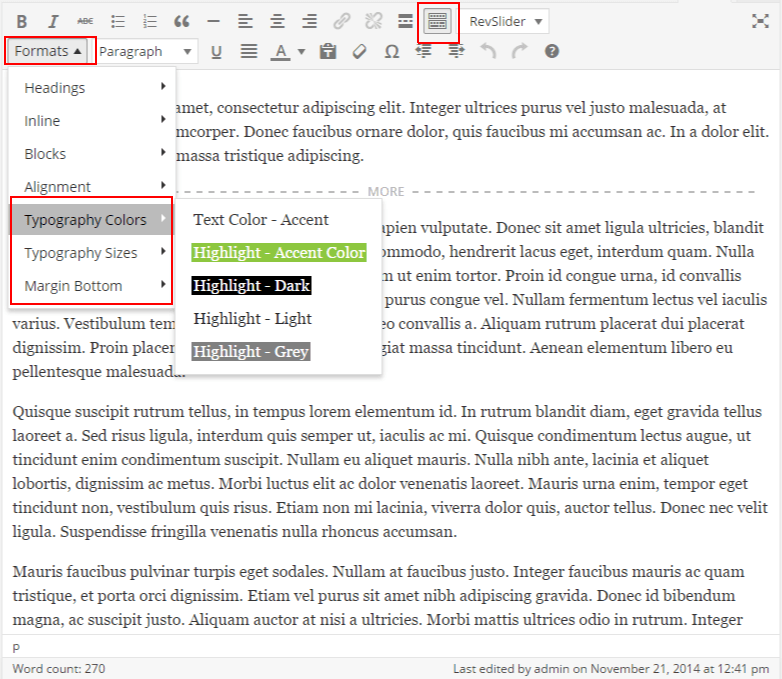 RevSlider docs are included in Docs folder. Portfolio Post Type – Enables a portfolio post type and taxonomies. Read more about Portfolio here. 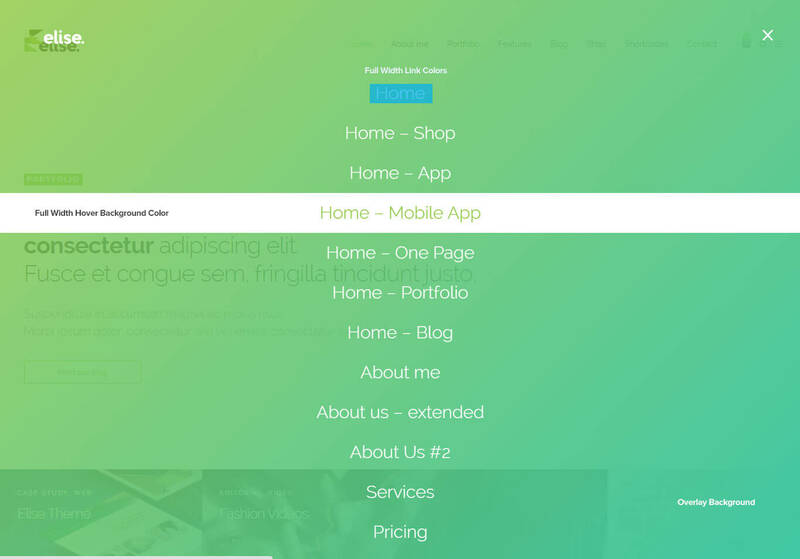 Stag Custom Sidebars – Create custom dynamic sidebars and use anywhere with shortcodes. Read more about Sidebars here. Envato WordPress Toolkit – WordPress toolkit for Envato Marketplace hosted items. Currently supports the following theme functionality: install, upgrade, & backups during upgrade. Plugin installation is very simple. After intallation you will notice info box with required and recommended plugins. All you need to do is click Begin installing plugins, then select particular plugins you need and click Install. After short while your chosen plugins will be ready to use. Global Options allows you to change theme apearance globaly with few simple clicks. All theme options shows screenshots below. It's also possible to overwrite global options and set custom settings for only patricular pages you need. 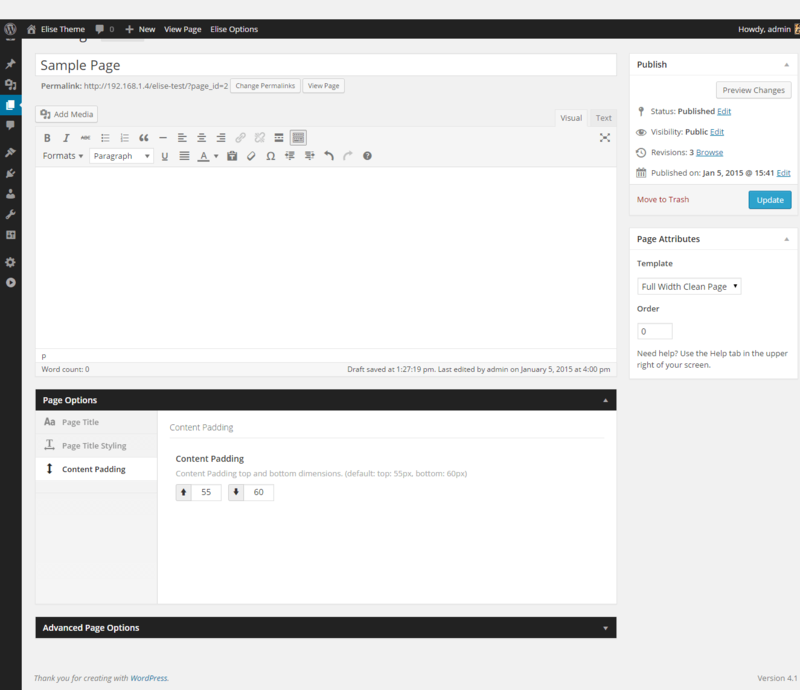 There is Page Title options and styling, Header options and styling and more. Layout Tab allows to change page layout on few ways. They are described in detail below. This option allows to select container width from 960 to 1200 pixels. This option allows to set gap between conent and background. This option allows to set layout border size. This option allows to select content padding top and bottom. This fields allows to set page background. This option allows to enable or disable shadow. This option allows to enable or disable Smooth Page Scrolling. This option allows to enable or disable responsive layout. Read more about Resposive/Mobile here. This option allows to enable or disable Back to Top button. Header Tab allows to set header layout on over 30 ways. 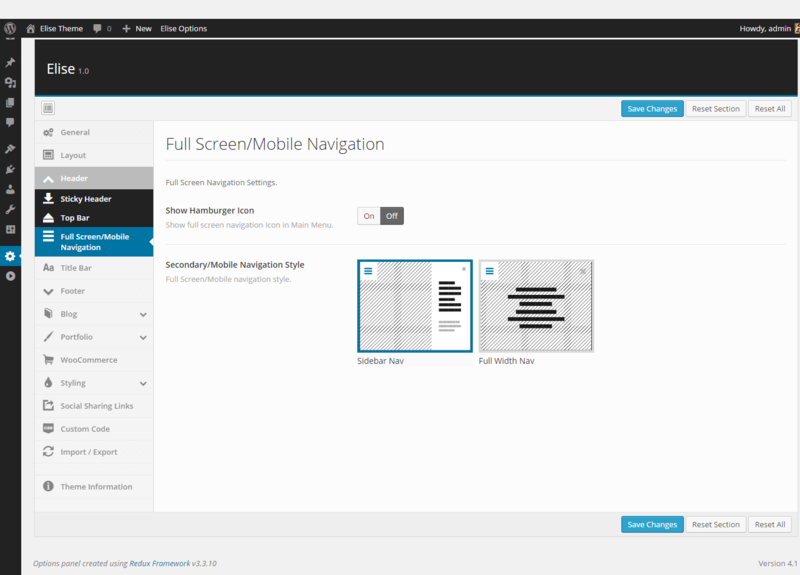 This option allows to stretch navigation to full width. This option allows to set transparent navbar background. This option allows to pick left, center or right position of Main Menu. This option allows to set navbar height from 50 to 300 pixels. This option allows to pick one of two menu hover styles. 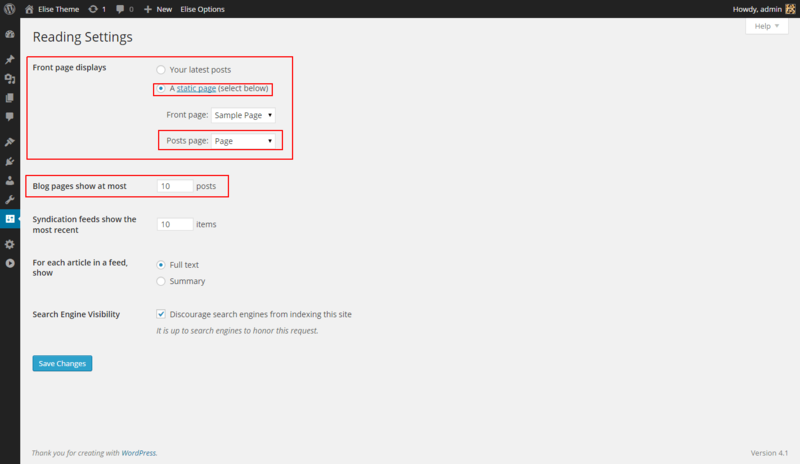 This option allows to enable or disable searching page in navbar. This option allows to enable or disable arrows when menu has submenu. This option allows to enable or disable sticky header. 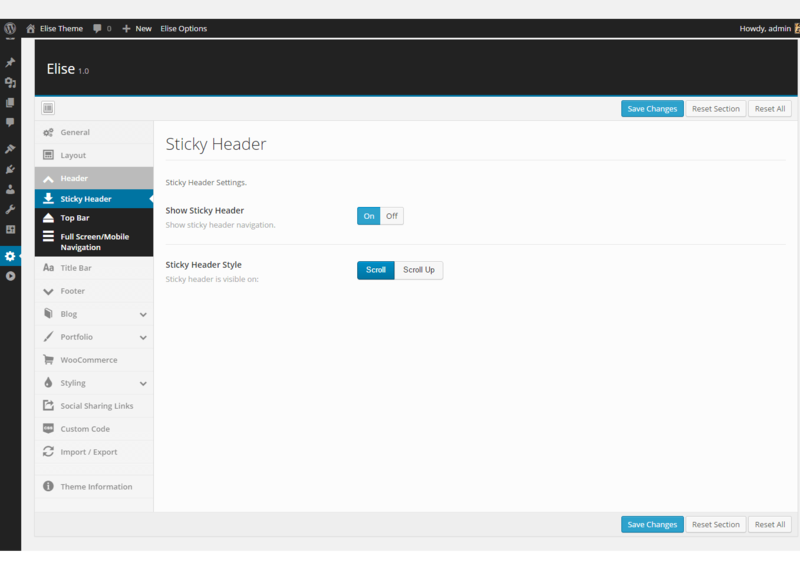 This option allows to pick one of two sticky header styles. This option allows to enable or disable top bar above header. This option allows to enable or disable "hamburger" icon in main menu. Read more about Resposive/Mobile here. This option allows to enable or disable title bar. This option allows to select position of page title. This option allows to set title bar top and bottom padding. This option allows to enable or disable breadcrumbs. This option allows to set breadcrumbs style. This option allows to enable or disable social share buttons on breadcrumbs bar. 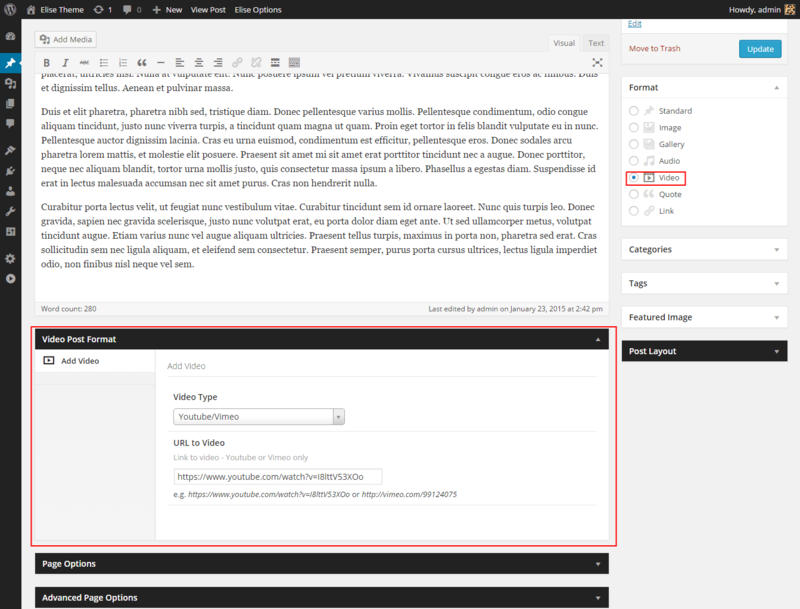 This option allows to select one of four blog styles. 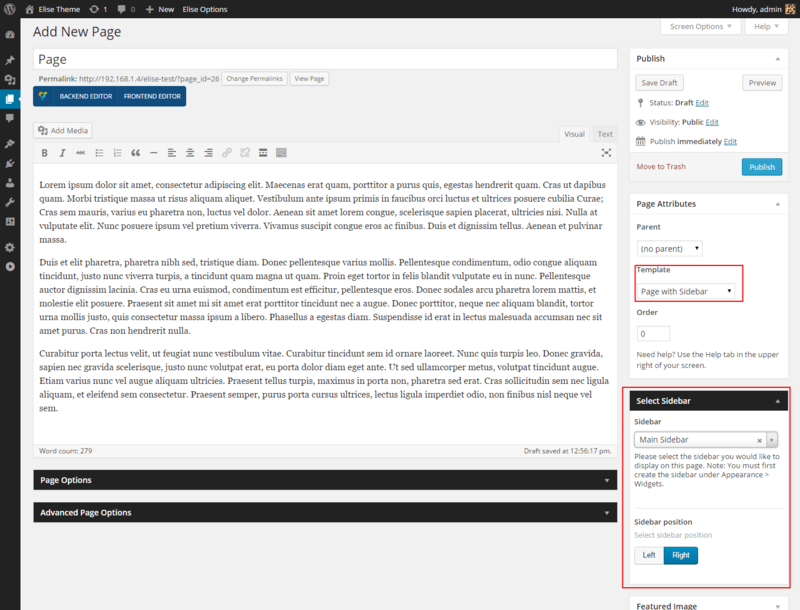 Show Sidebar – Not available for "Centered Blog Layout"
This option allows to enable or disable blog sidebar. This option allows to select sidebar position. 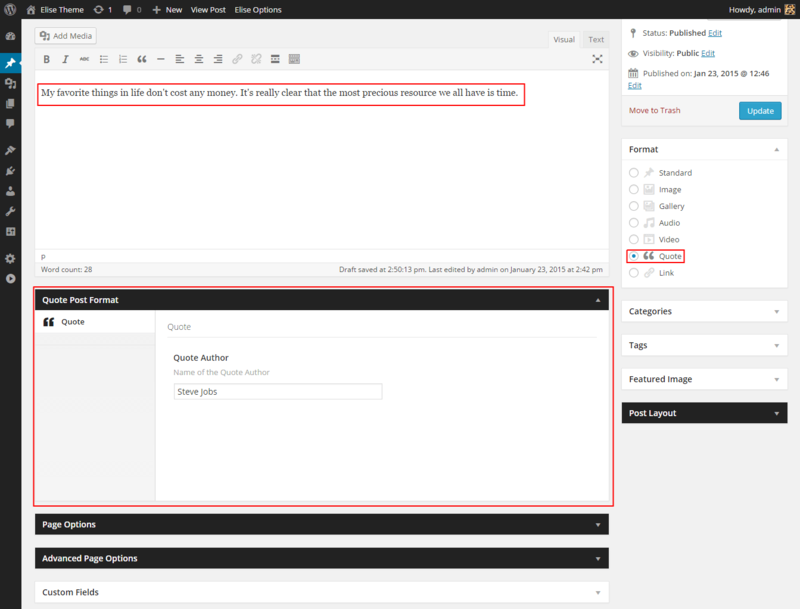 This option allows to set blog post thumbnail position. This option allows to set automatic post excerpts for posts from 10 to 200 words. 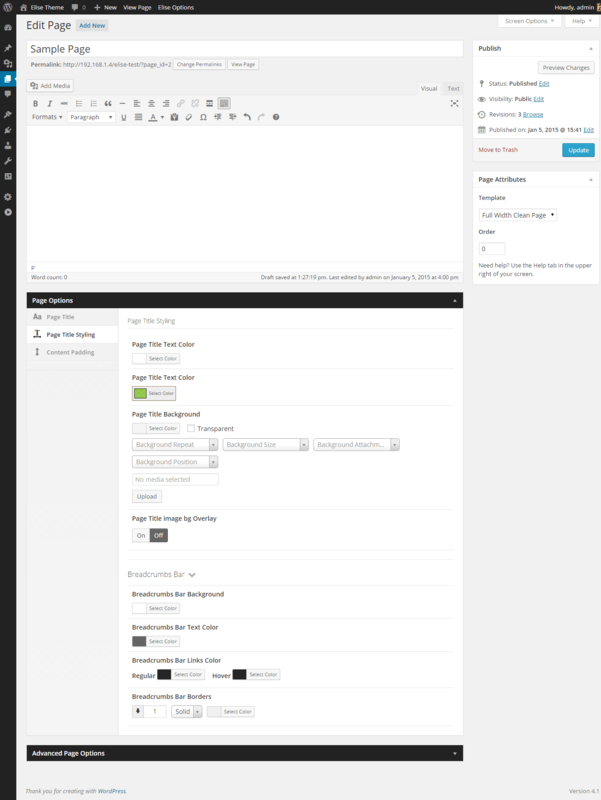 This option allows to set custom Single Posts Layout, different than blog layout. Globally or for Single Post. This option allows to enable or disable post share buttons. This option allows to enable or disable displaying tags under post. This option allows to enable or disable displaying post author's bio. This option allows to select one of five portfolio styles. This option allows to set full window width portfolio. This option allows to enable or disable portfolio items filtering. This option allows to paginate portfolio items. This option allows to set one of two portfolio items styles. This option allows to enable or disable categories name above the Project title. This option allows to enable or disable quick view button. This option allows to set gap between portfolio items from 0 to 30 pixels. This option allows to set custom project slug. This option allows to set single project layout. 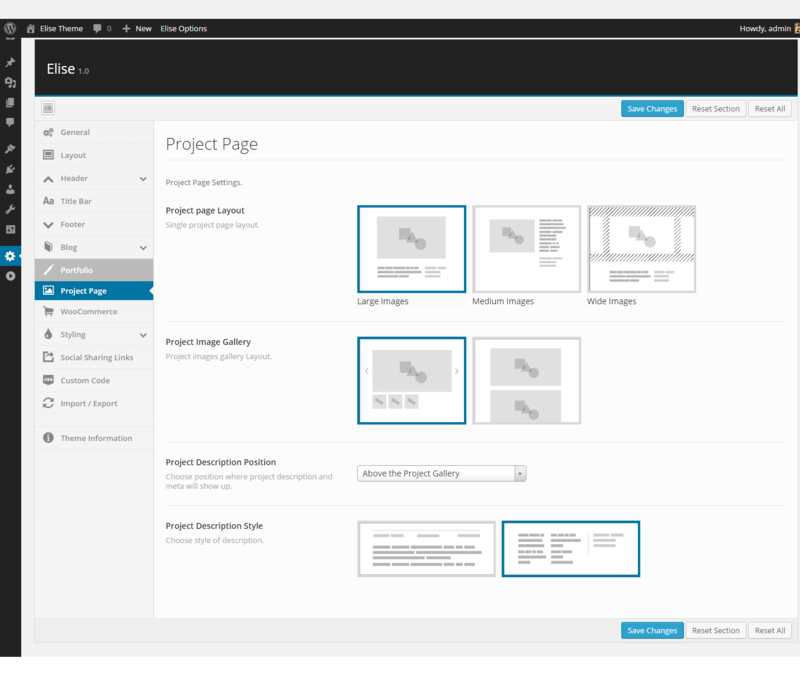 It's also possible to set custom project layout for single project page. This option allows to set one of two way of displaying gallery images. 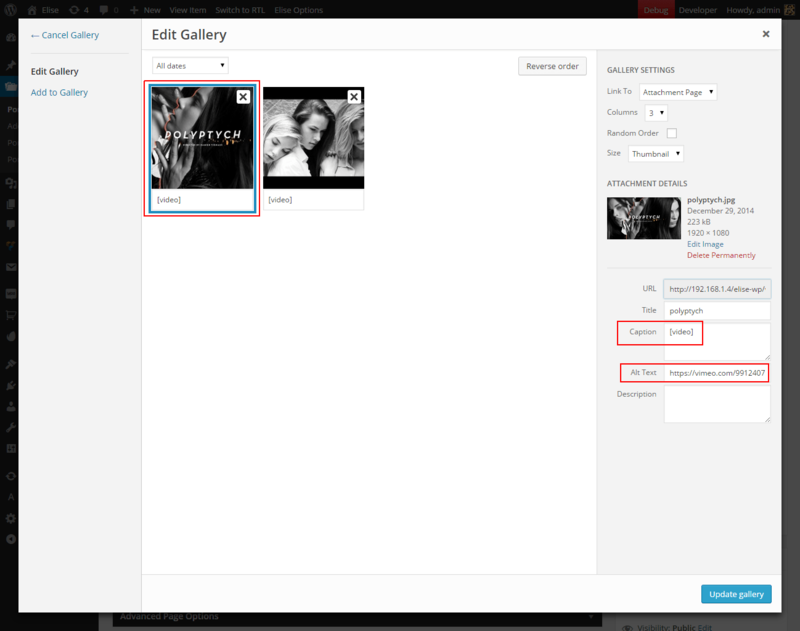 This option allows to set Wide Project Layout gallery height. This option allows to set position of project description. 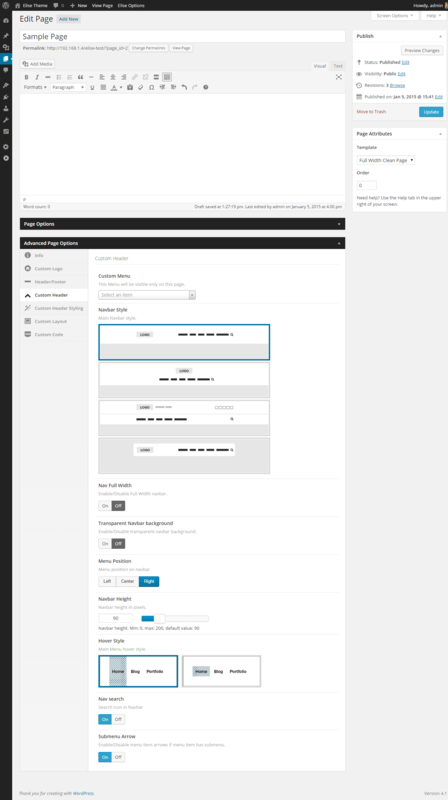 This option allows to set one of two project description layouts. This option allows to enable or disable footer widget area. 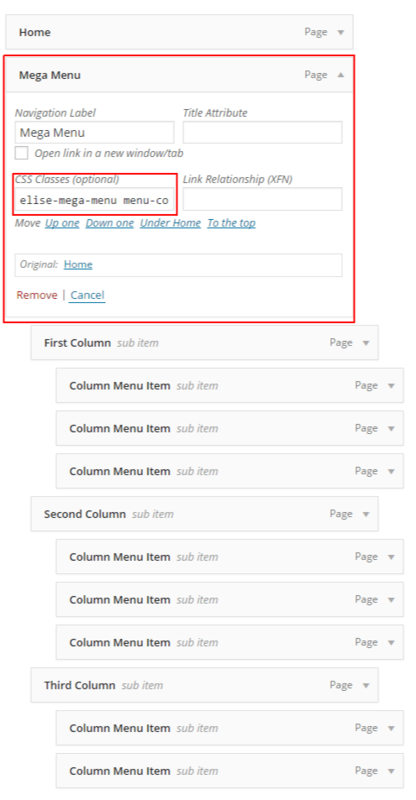 This option allows to select columns set of footer widget areas. This Tab allows you to control theme colors with no touching single line of code. 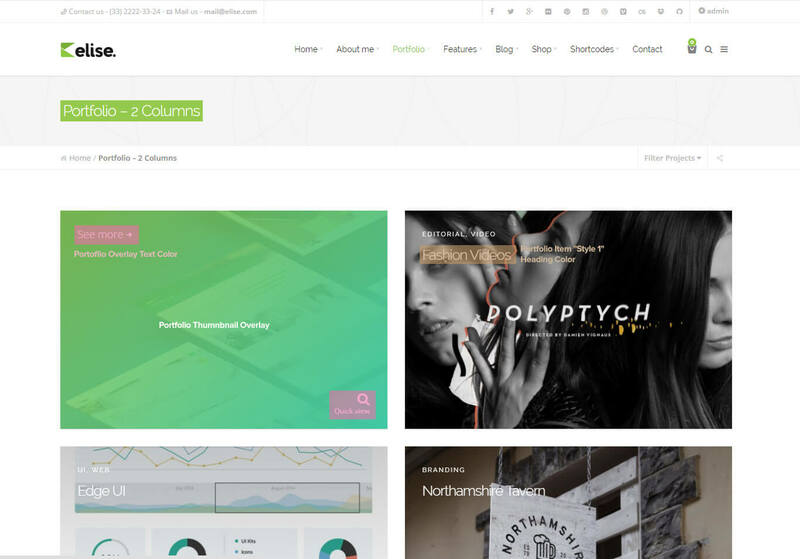 Theme contains a few beautifully designed Page Templates, which allows you to show content depends on your needs. Default Template - basic, simple Template with content width container and top and bottom padding (which you can control via Global or Page Options). 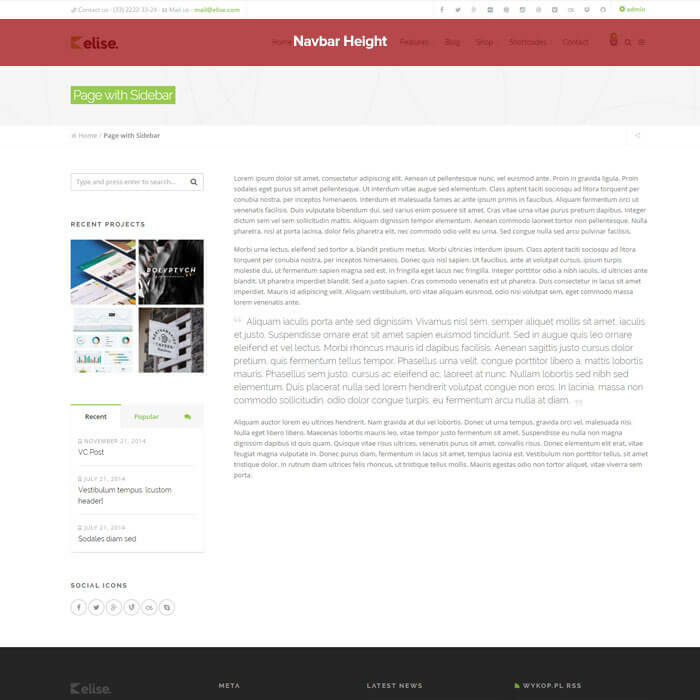 Full Width Clean Page - clean full window width Template. No containers, no paddings, no limits. 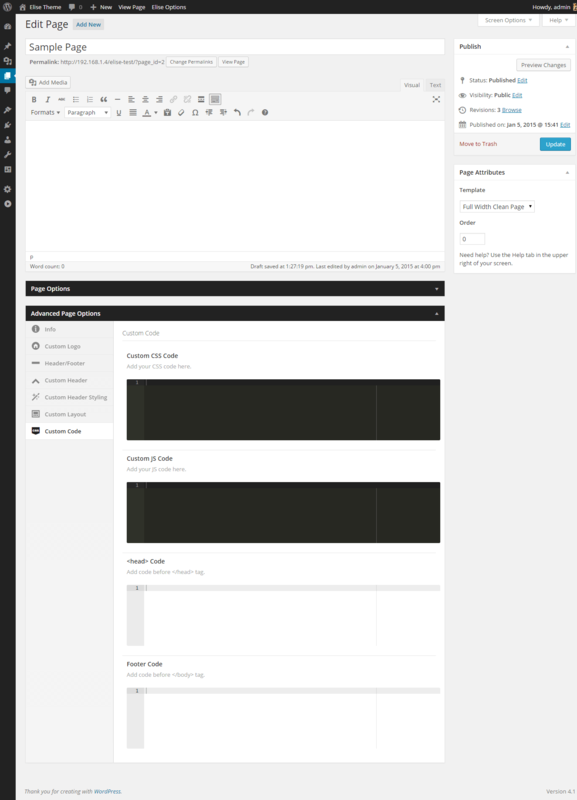 Template ready for Page Builder. Page with Sidebar - simple page with left or right sidebar which you can select from a list. Portfolio - page with your Portfolio Projects. Read more Here. 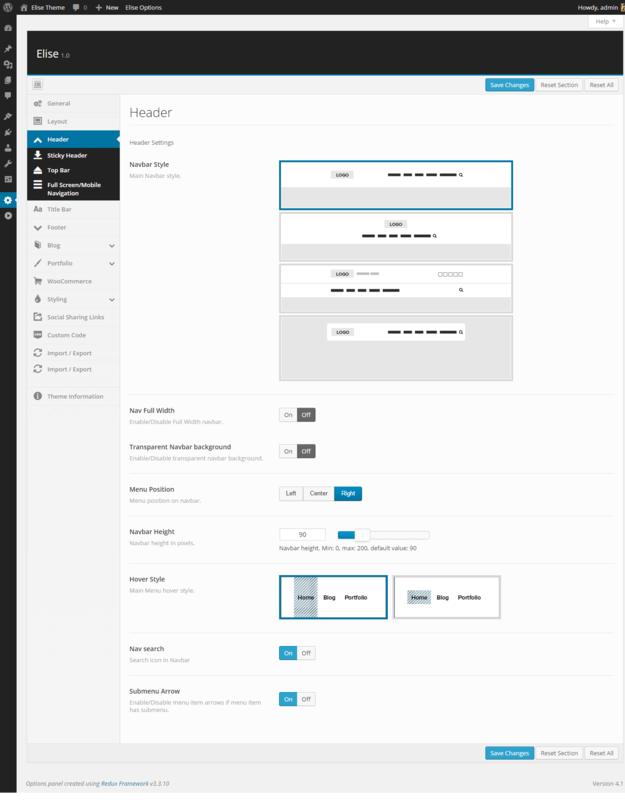 Side Navigation - page with Side Navigation which shows pages contained under one Parent. Advanced settings allows you to overwrite global options and create single page more unique. For example you can disable header and/or footer, extend page title, set different header colors and many more... More about Single Page Options here. To Add new post go to Posts -> Add New. Type Page Title, Post Content, select Categories, Tags and set Featured Image. Elise Theme supports Post Formats, you can select one of 7 different post types - more about Post Formats you will find below. 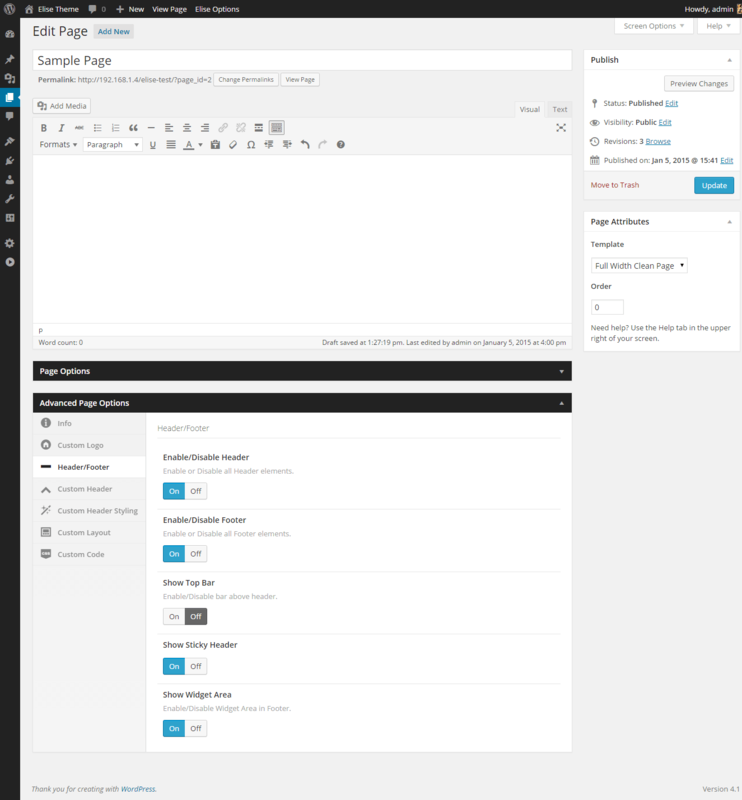 Theme also allows you to set more advanced post settings and Single Page Options. You can set different layouts for every single posts. Read more about Post Layout here. Blog is set as Home page by default, but you can set your own Blog Page. To do this create new blank Page, then go to Settings -> Reading and select Front Page displays to A static page (select below). Now you can pick your page created earlier for displaying posts. You can also set here number of posts displaying in one page. 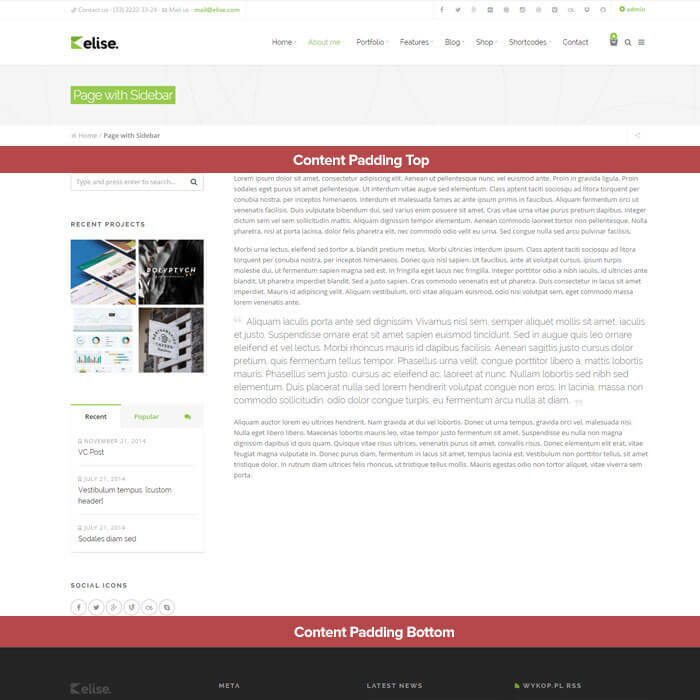 Elise Theme supports WordPress Post Formats, they are fully styled and funcional for displaying specific content. Standard - default post with cropped featured image. Image - post with full size featured image. Gallery - post with images gallery slider. Audio - post with upladed or embeded audio. Video - post with video. Quote - post with quote. Link - post with link. For the best user experiences you should always upload images with dimensions big enough to generate non-stretched and Retina displays ready Thumbnails. * images width depends on Theme "Content Width" dimension. For Portfolio is required Portfolio Post Type plugin. Read more how to install. To add new Project go to Portfolio -> Add New Item. Now you can Type Project Title, project decription, add project images gallery, set project layout and many more... More info and live examples here. To add Video in project slider or inline gallery click Add/Edit Gallery button in Project Gallery Options, then upload image which will be video thumbnail. Select upladed image. In "attachment details" settings type [video] in "Caption" Field and paste YouTube or Vimeo link in "Alt Text" field. It supports only Youtube and Vimeo videos. Now when you have project to display, you can create Portfolio Page. To do this go to Pages -> Add New then select page template to Portfolio. You can select particular categories to display, which allows you to create unlimited portfolio pages with specific projects and layouts. More info and live examples here. 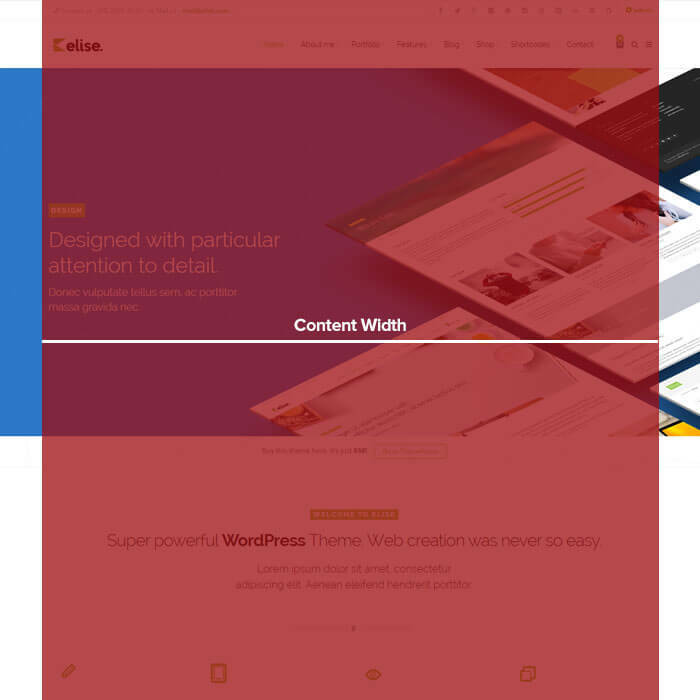 * images width and height depends on Theme "Content Width" dimension. 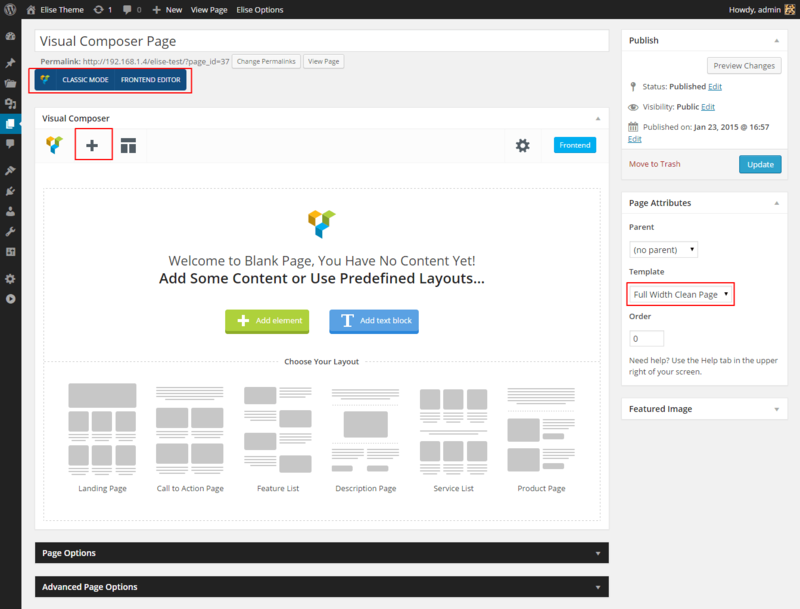 For Page Builder is required to install WPBakery Visual Composer plugin. Read more how to install. 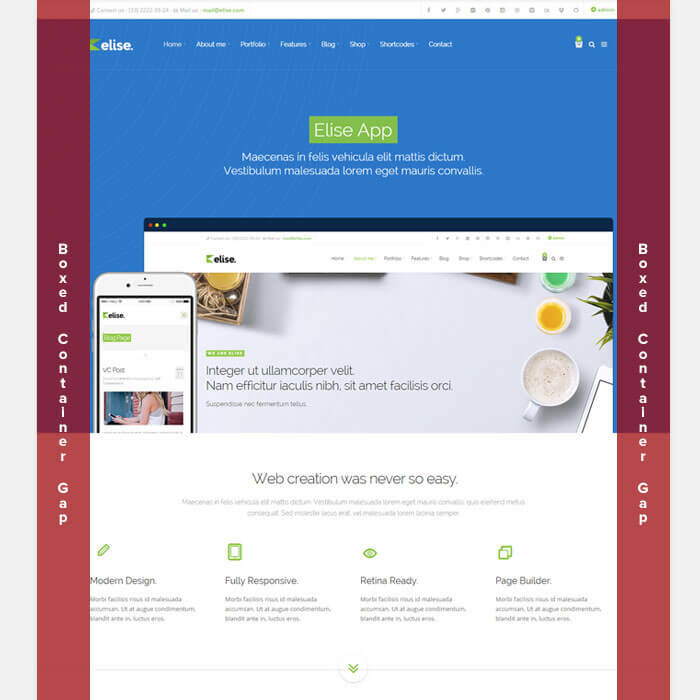 Elise Theme includes amazing Drag & Drop Page Builder - WPBakery Visual Composer. This Plugin gives your powerful control over you WordPress Page with no programming knowledge required. Plugin includes build-in and Elise designed shorcodes. Read more about shortcodes here. Page creation with Visual Composer is very simple. To do this create new Page then click Backend Editor or Frontend Editor button. Now you can add, remove, move and adjust elements depends of your needs. 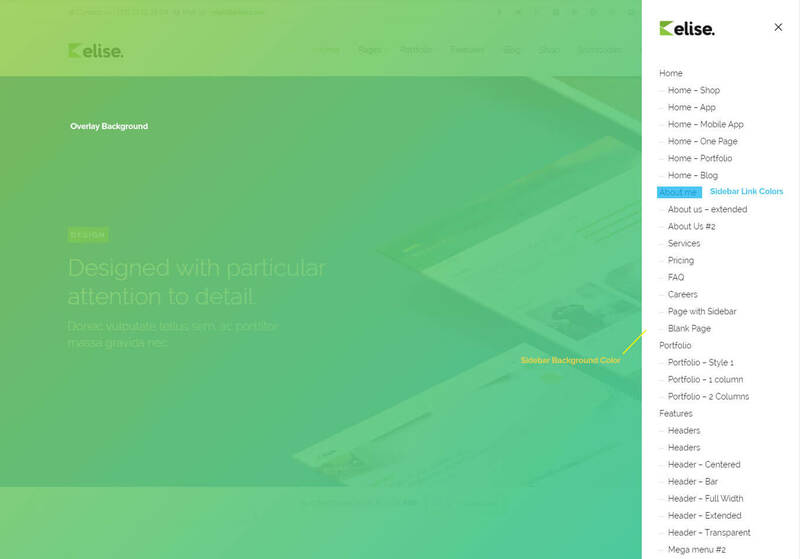 It's also recommended to set page Template to Full Width Clean Page.. That option gives you more control in page creation, like full window width sections with custom backgrounds etc. Page Builder in Posts and Portfolio Projects. It's also possible to build Posts and Portfolio Projects width Visual Composer. 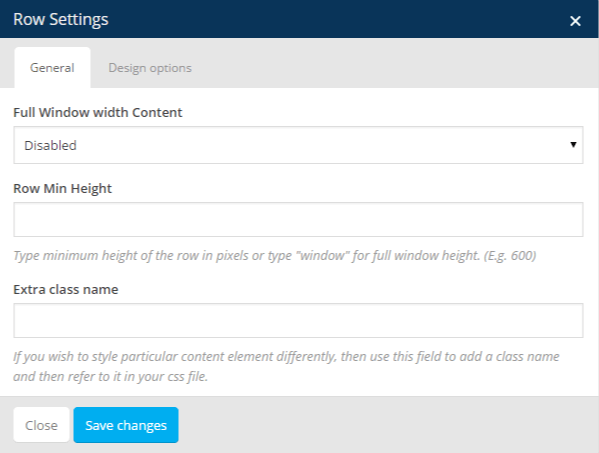 To enable this option go to Settings -> Visual Composer then in General Settings Tab pick content types you need and Save Changes. List of shortcodes available in Elise Theme. Rows are basic Visual Composer elements. They are wrapper for all other elements. Rows contains extended options which allows you to control page columns and section backgrounds. Full Window width Content – enable/disable full window width content. Row Min Height – you can set height of the row. Extra class name – row custom class. Background Position – "standard" background position. Show Overlay – enable/disable overlay above background allows to darken, lighten or colorize background image. Drop Shadow – enable/disable row shadow. 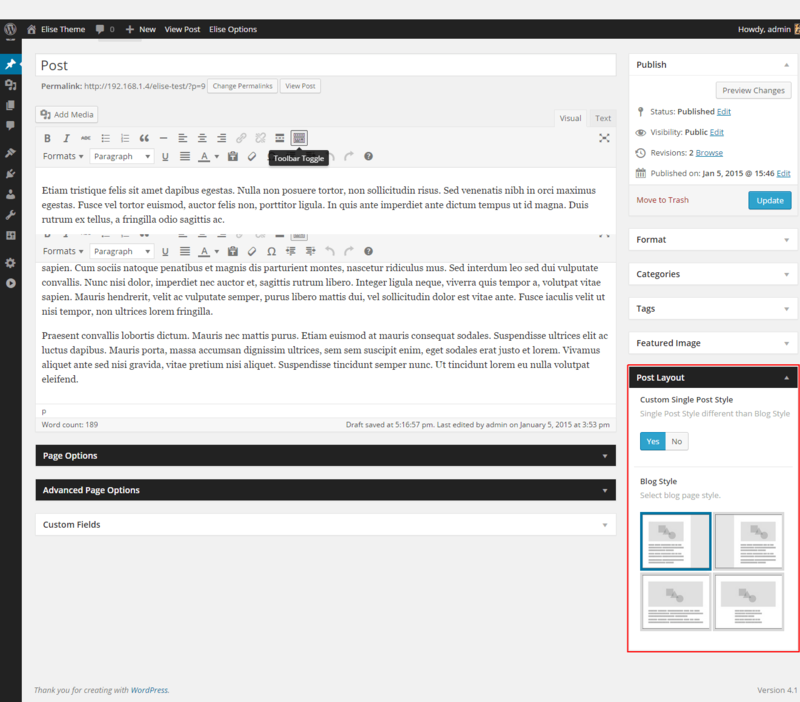 A baic block of text with WordPress WYSIWYG editor. Also read about Custom Elise Theme Text Formats. Extra class name – element custom class field. Css – basic css editor. Toggle element for Q&A block with many styles to choose. Toggle title – title toogle - Q&A question. 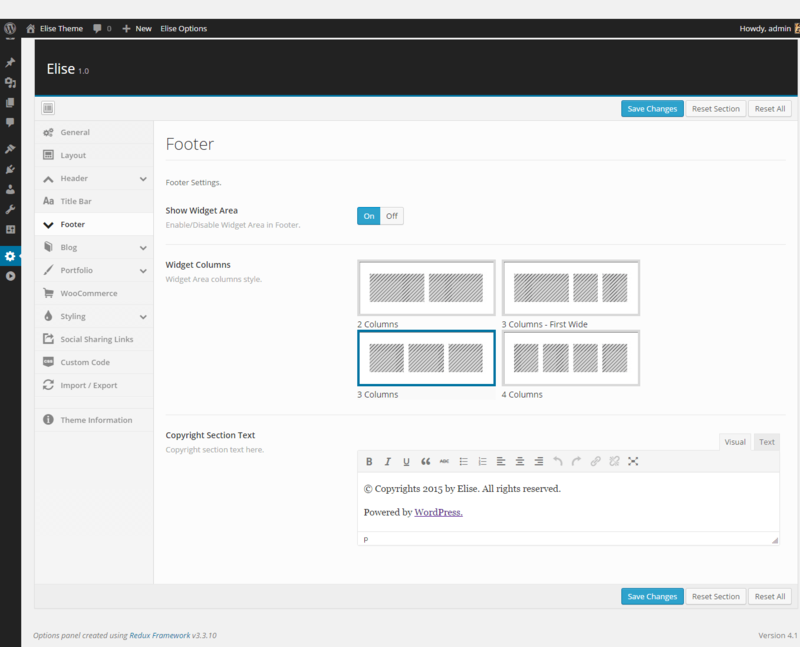 Toggle content – WYSIWYG editor. Default state – toogle default state - open or close. Element which allows to place selected sidebar. Read more about Sidebars here. Sidebar – dropdown field with available sidebars. Element which allows you to place media player on you page. List of supported sites. Video link – media content url link. Element which allows you to place raw HTML code on your page. Element which allows you to place blank space with custom height. Height – space height in pixels. Extra class name – element custom class. Element which allows you display a list of events in chronological order. For example history of education or company. Timeline Axis Position – position of timeline axis. Left, Centered or Right. Extra class name – element's custom class field. 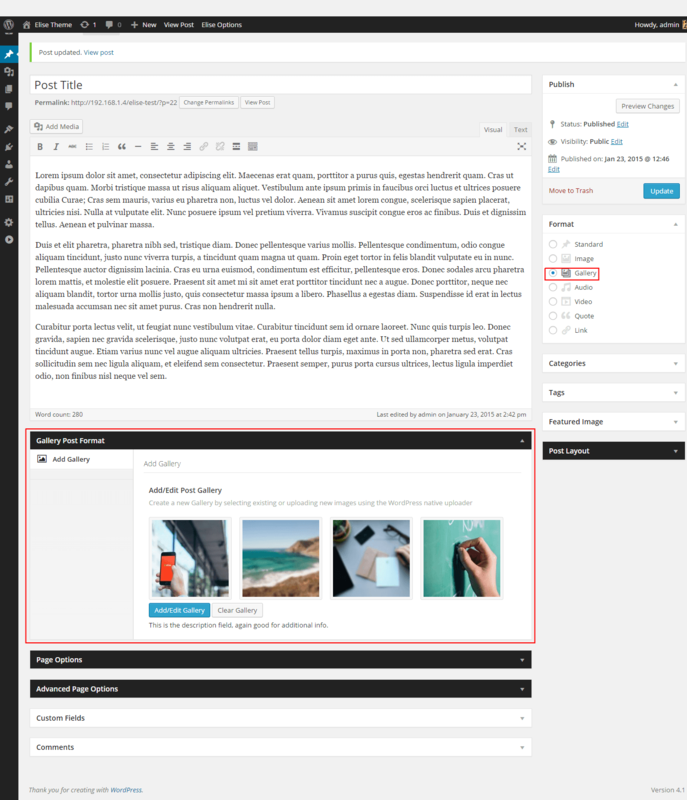 Timeline Block Content – WYSIWYG field for event description. Title Color – color of event title. Background Color – event block background color. Element allows to place eye-catching, highly customizable block with icon. Icon library – list of available icon libraries. Title – title of iconbox. 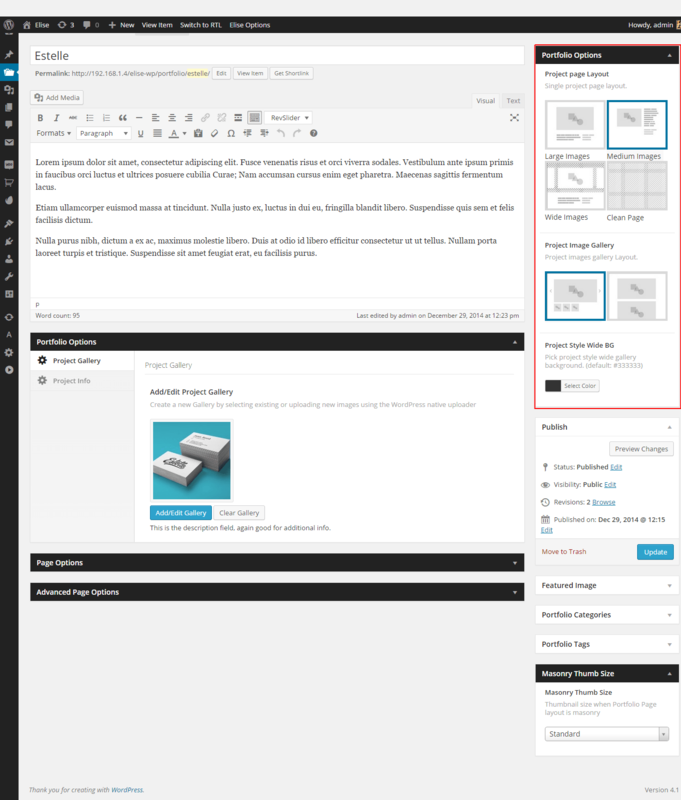 Content – iconbox WYSIWYG content editor. Button – iconbox "read more" button. Extra class name – element's extra class field. Icon Box Style – Block or Inline iconbox style selector. Display icon above or inline with title. 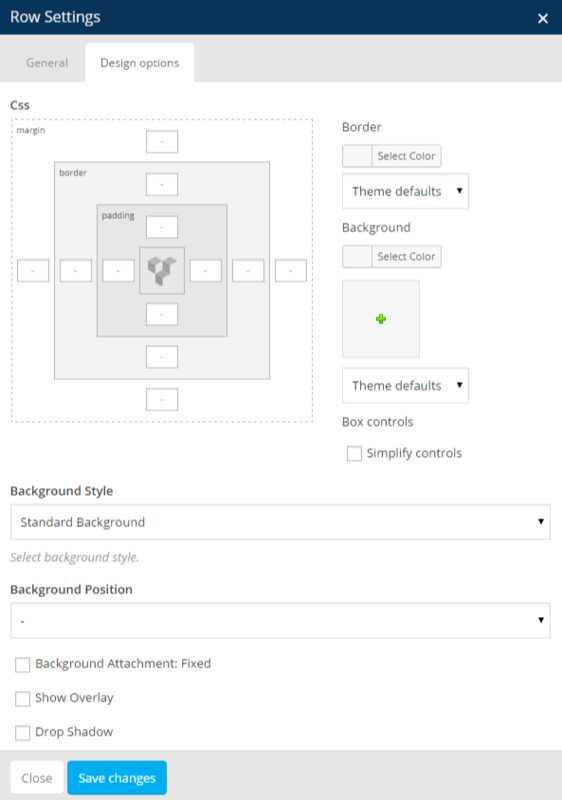 Icon Box Layout – iconbox layout selector. Simple or Boxed layouts available. Iconbox Align/Iconbox Inline Align – iconbox content alignment. Iconbox Header Size – iconbox title size. From h2 to h6. Header Color – title color. Icon Style – icon style selector. Square, Circle or No background options. Icon Size – standard or large icon size selector. Icon Color – color of icon. 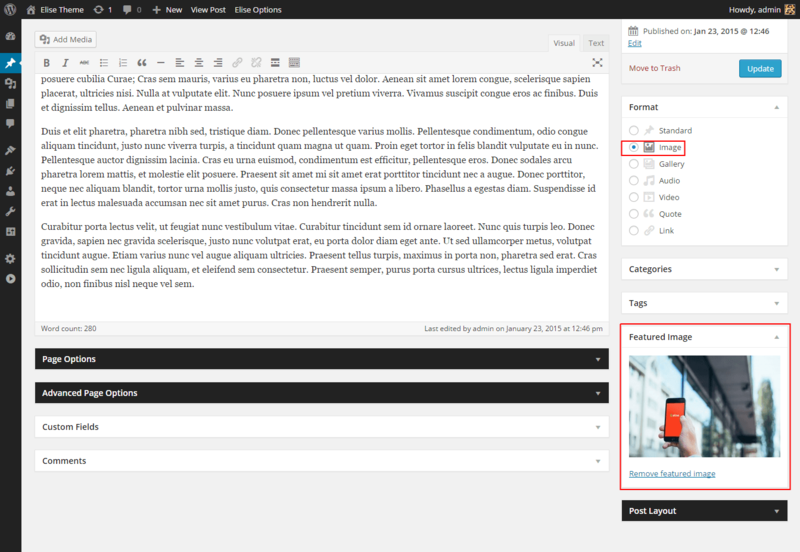 Element allows to place blog content. 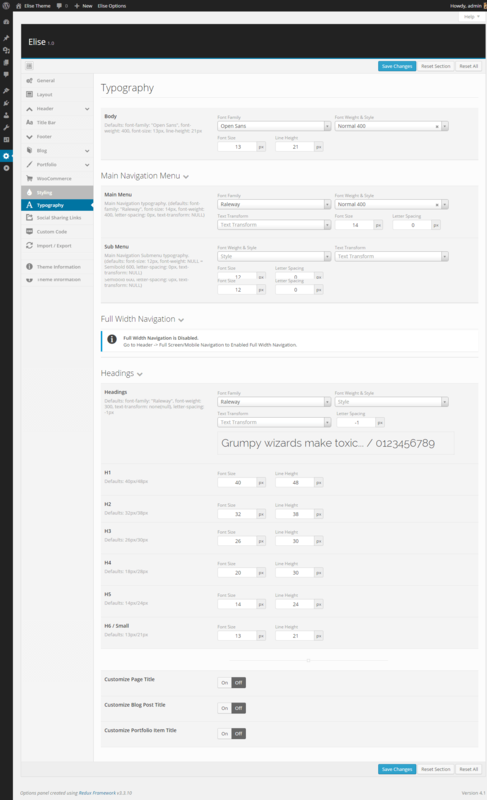 This element's setting depends on Theme options "Blog Settings". 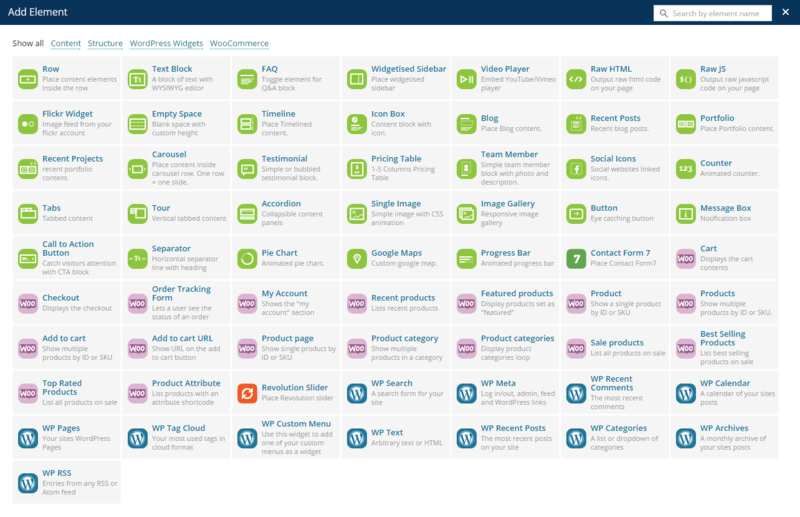 Blog Categories – available categories to select. Element display recent/latest posts from blog. Categories – allows to select catagories to display. Columns – number of posts columns. Number of Posts – allows to set number of posts to display. Recent Posts Style – Grid or Carousel dispplay style. Carousel Arrows Position – "Carousel" style prev/next icons position. Background Color – background of single post block. Text Color – text color of single post block. Portfolio element which allows to display list of projects. Extended options available. Portfolio Categories – type selected categories to display. Portfolio Items – number of project to display. 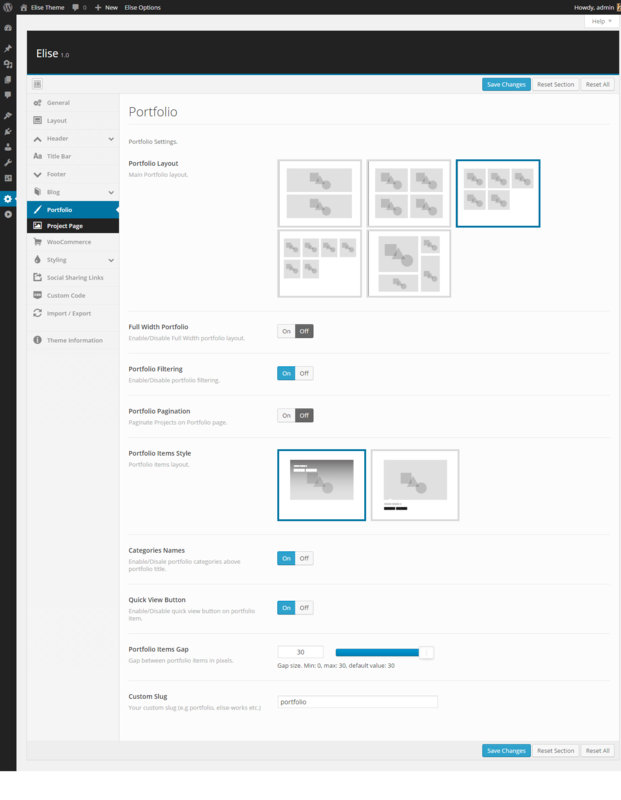 Portfolio Layout – 1-4 or Masonry layout options. 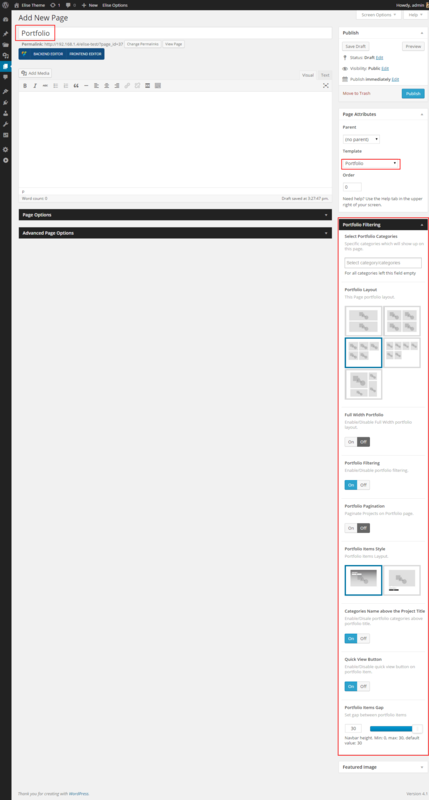 Portfolio Pagination – enable/disable projects list pagination. Items Per Page – number of items per page to display. Extra class name – element's custom class. Portfolio Filtering – enable/disable projects list filtering. Filtering Position – left, center or right postion of filtering. Filtering: Active Category Background – background of active category. Filtering: Active Category Color – color of active category. Filtering: Categories Color – text color of available categories. Portfolio Style – projects list style. Portfolio Items Gap – gap between projects list. Quick View Button – enable/disable quick view button available in project item hover state. 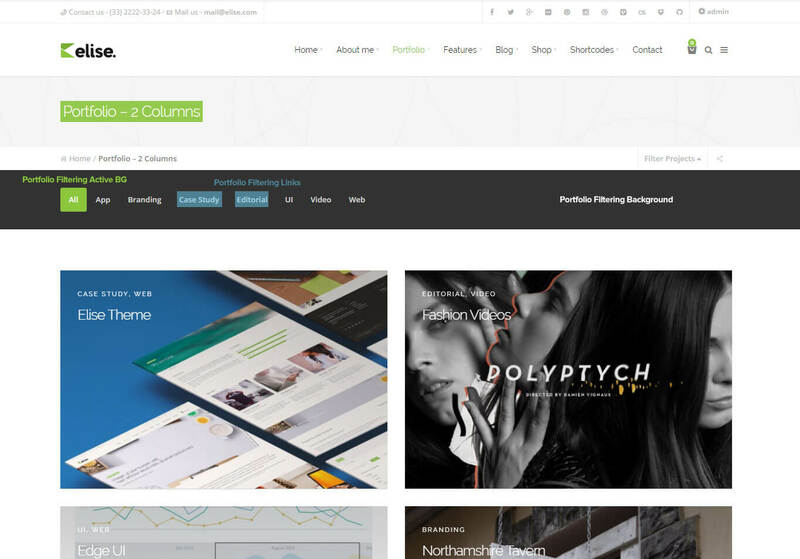 Recent Portfolio Columns – 1-5 Columns layout. Recent Projects Style – Standard Grid or Carousel style. Carousel Arrows Position – position of prev/next icons when "carousel" style selected. Recent Project Number – number of latest projects to display. Portfolio Items Gap – gap between portfolio items. CSS Animation – allows to select element animation when appear on page. Extra class name – element's extra class. Allow to place carouseled content on page. One row inside "Carousel" element equal one slide. Carousel Arrows Position – position of prev/next icons of carousel. Carousel Bottom Navigation – enable/disable bullet naviagtion under carousel element. Autoplay – carousel autoplay in miliseconds. E.g. 5000ms = 5 seconds. Slides Background – background of slides in carousel. Pricing Columns – 1-5 Columns selector. Featured Column – allow to set column as "featured". Featured Text – featured text. E.g. "Most Popular Plan!" Background Icon – allow to set plan icon in background. Header Background Color – plan title background color. Header Colors – plan title text color. Features Background Color – plan list background color. Features Color – plan list text color. Element with team member data. Member Photography – photography of team member. Name – member first and last name. Member Bio/Description – member description. Name Color – text color of member name. Function Color – text color of member funcion. Place social icons with profile URL. Icons Size – size of icon. Social Profile URLs – fields for social profile urls. Place animated element with counting value. Start Value – counter start value. End Value – counter end value. Decimals – number of value decimals. Prefix – place string/text before counter value. Suffix – lace string/text after counter value. Subtitle – text describing counter value. Counter Speed – counter animation speed. Counter Align – left, center or right counter algnment. Number Color – text color of value. Subtitle Color – subtitle text color. Element with a single content area and multiple panels. "Tabs" element display planels horizontally, "Tour" - vertically. Auto rotate tabs – enable/disable auto rotate of tabs. 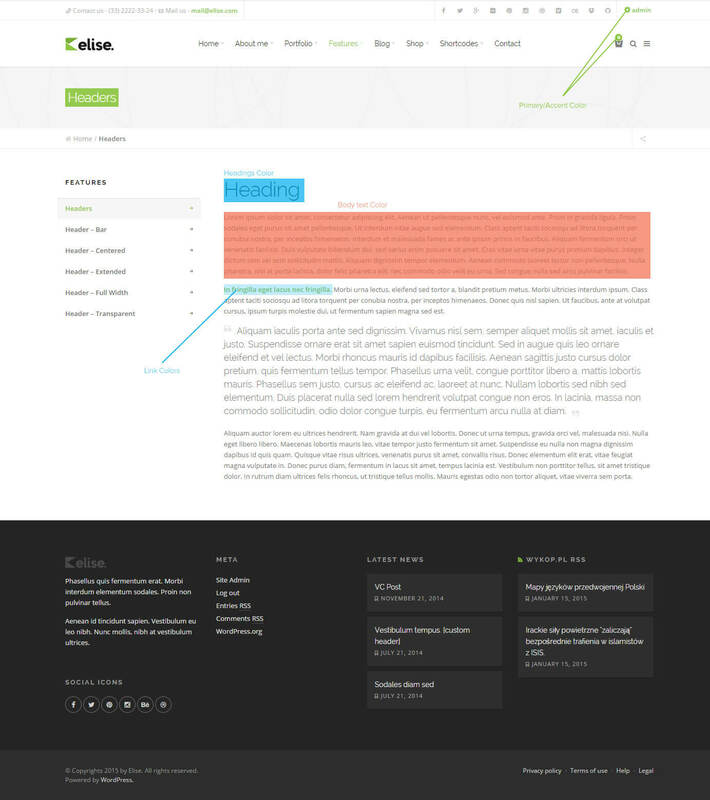 Background Color – background of content and active tab. Active Tab Text Color – text color of active tab. Tabs Background – non-active tabs background color. Active section – allow to set which section will active by default. Allow collapsible all – allow to collapse all sections. Accordion Background – background color of accordion secion. 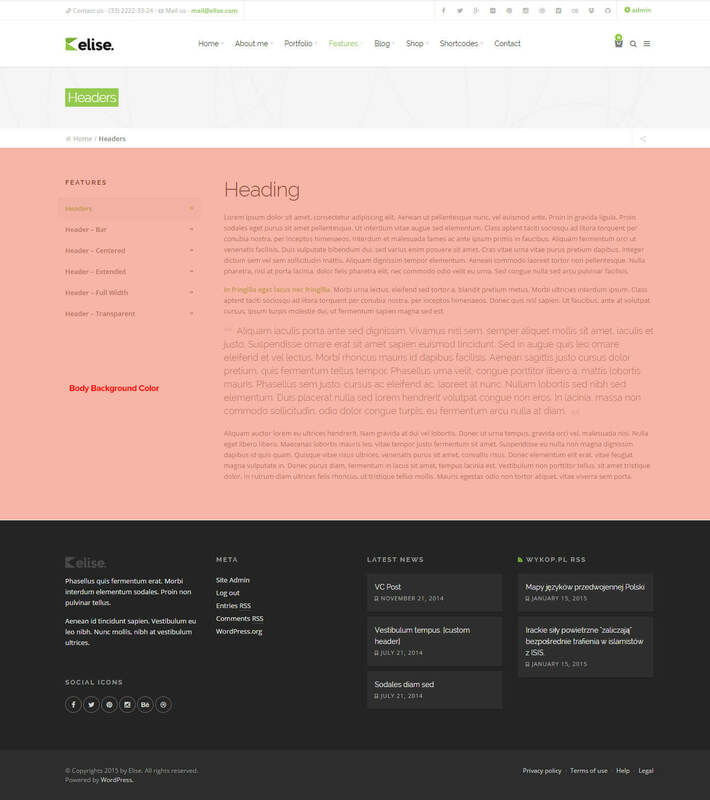 Accordion Header Color – text color of accordion title. Image size – set custom size of image. Image alignment – left, center or right alignment of image. Image Drops Shadow – enable/disable image shadow. Link to large image? – allows to set image as link. Link Target – external link. Image Caption – display text caption on image. Image style – postion of caption on image. Gallery type – grid or carousel gallery images type. Carousel Navigation – "carousel" bullet or thumbnails navigation style. On click – define action for onclick event if needed. URL (Link) – button url. Message box type – type of notification. Background Color – background color notification box. Element allows to catch to visitors attention. Promotional text – text editor. Custom Background Color – CTA box background color. Style – separator line style. Title – text inside separator line. Title position – position of text/icon inside separator. Margin Bottom – allow to set margin bottom size. Element with animated pie chart. Name – text describing value. Size – size of pie chart in pixels. Pie Thickness – thickness of animated line. Show "%" Unit – enable/disable "%" unit after value number. Pie Color options – solid or gradient animated line options. Pie Second Color – "gradient" option - second color. Pie Background Color – background of pie chart line. Pie value Color – value text color. Pie Alignment – left, center or right alignment of pie chart. Place Google Map with selected address or coordinates. Address – address or coordinates. Map Zoom – zoom size. Map Height – height of google map. Map Style – allow to set custom map style. Bar custom color – color of animated bar. WooCommerce element. Read more about WooCoomerce intergration. 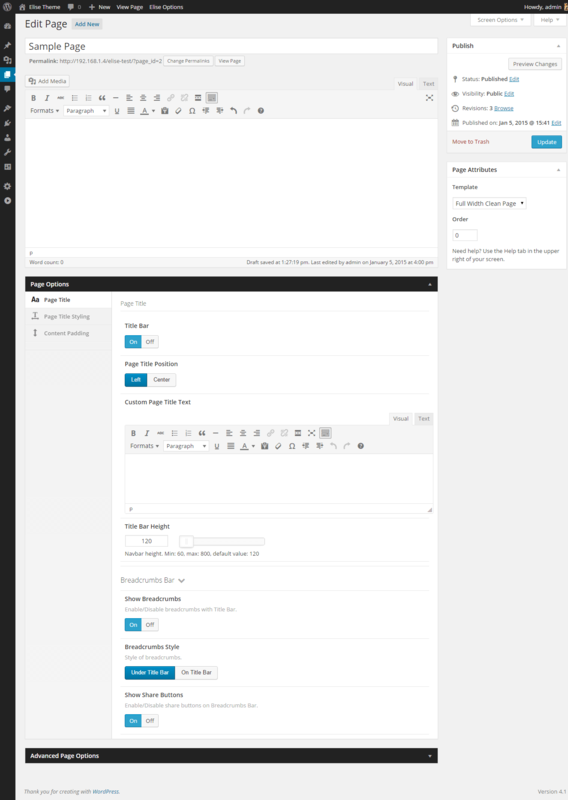 WordPress widget elements ready to place and use. After successful installation and after installation process, you can import Demo Content Data. But first you need to install all required and recommened plugins. To import dummy data go to Theme Options -> Demo Importer and click Import Demo. After short while demo content will be downloaded. Import sliders. To import "Revolution Slider" slides go to Revolution Slider tab and click Import slides button. Select slide .zip file which you will find in "Demo Content / Sliders" folder. Import all slides. In last step go to Settings -> Reading Settings and set "Front page displays" to A static page (select below). Select Home to "Front Page", and Blog - Default Large Image for "Posts page". After selecting pages click Save Changes button. That's all - importing proccess is complete! 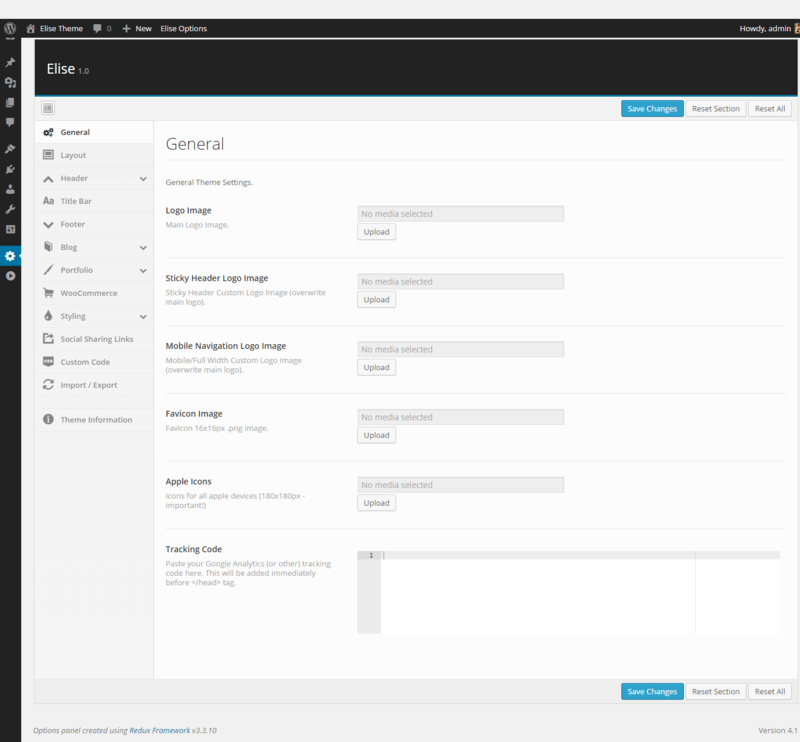 Elise Theme Package contains Elise Child Theme. Child themes are the recommended way of modifying an existing theme. More information you will find here. To use child theme all you need to do is install and activate in same way as main theme. 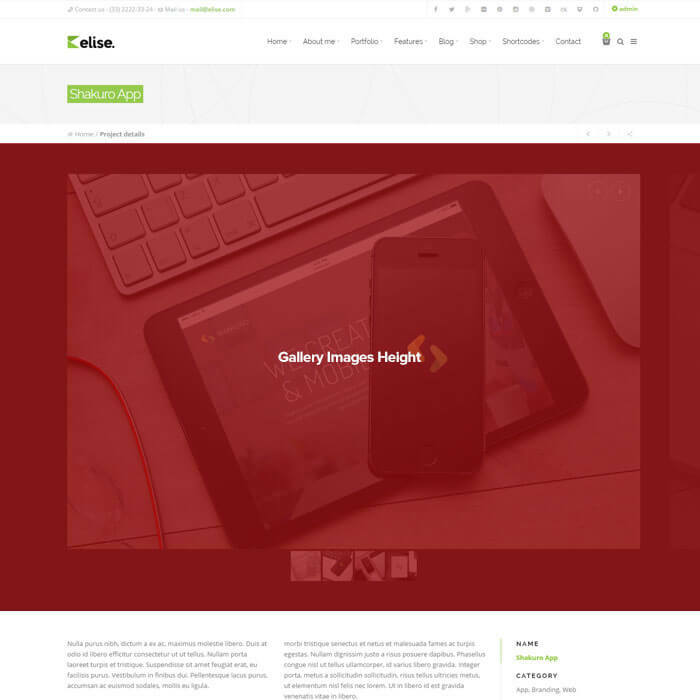 Elise Theme is compatible with WooCommerce Plugin and includes full design integration. To get started with creating your online store, you need to install free WooCommerce Plugin. All necessary information how to get started with WooCommerce you will find on official Plugin website and plugin documentation. Elise Theme includes amazing premium Revolution Slider worth $18. This plugin allows for showing almost any kind of content with highly customizatable effects and animations. Useful links: Official Revolution Slider Website - contains useful information about plugin and using examples. Elise Theme package also contains full plugin documentation. Elise Theme contains .po/.mo files which means is ready to translate. Is also compatible with WPML Plugin. After you have installed Poedit, you can open it and select File > New Catalog from POT file. Then select the default.po file from the theme you wish to translate which you can find in the /languages/ folder of your theme. Then go through every line of text and translate it to your native language. Afterwards you can save the file with yours translatet strings (for example pl_PL.po). Poedit automatically creates the .mo file and saves it, too. 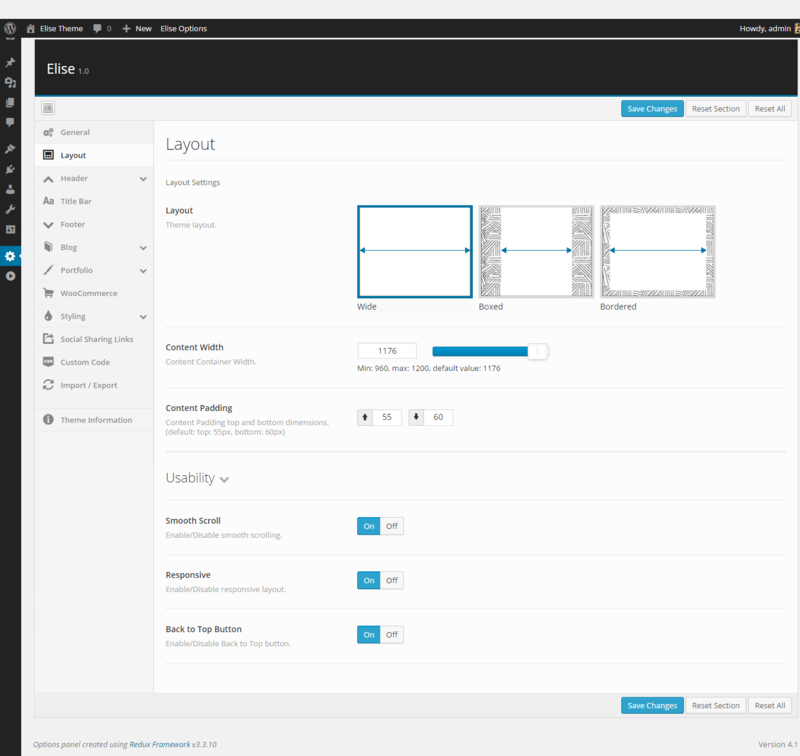 Elise Theme contains built-in classes which allows you to enable simple Mega Menu with 2,3 or 4 Columns. Mega Menu can be disaplyed only in Main Navigation menu. Instruction how to activate mega menu you will find below. First, go to Appearance -> Menus, then enable "CSS Classes" option for menu items. Click "Screen Options" on top of the screen and select "CSS classes" in advanced properties. In "Main Menu" add first level Menu Item which will be contains all Mega Menu Element. 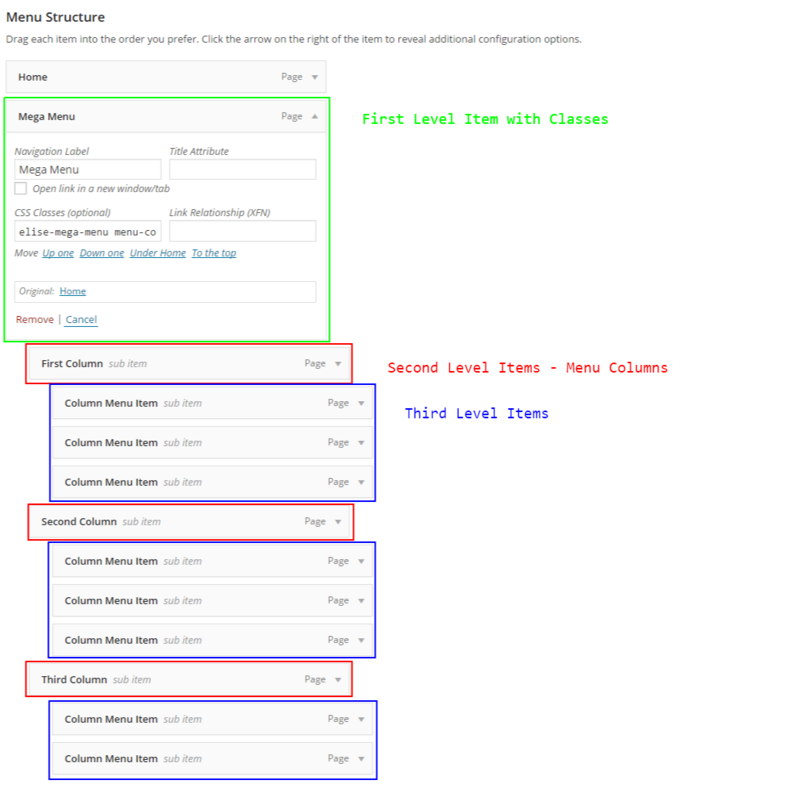 In this item settings in field CSS Classes (optional) type: elise-mega-menu menu-columns-3. Those classes will enable Mega Menu. You can select between 2, 3 or 4 column menu. Add second level menu items. Second level menu item will show the title text above each column. Third level menu items will be smaller menu elements. 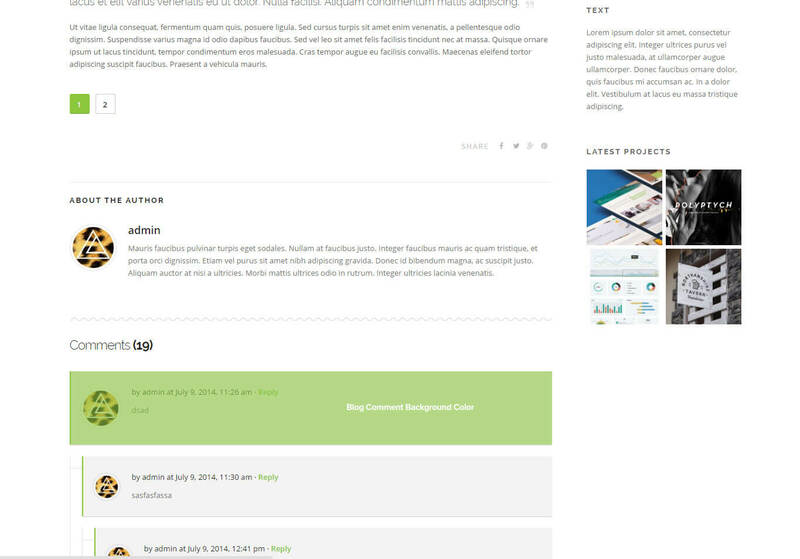 With Stag Custom Sidebars plugin you can create unlimited sidebar widget area. To Add new widget area go to Appearance -> Widgets. You will see there "Custom Widget Area" field. Type your widget area name and click "Add Widget Area". That's it - sidebar is ready to place on your pages with "Page with Sidebar" Template or Visual Composer "Widegtised Sidebar". Elise - Recent Posts Tab – A widget that displays Tabs with recent/popular posts and recent comments. Elise - Recent Projects – A widget that displays recent projects. Elise - Social Icons – displays social icons with profile urls. 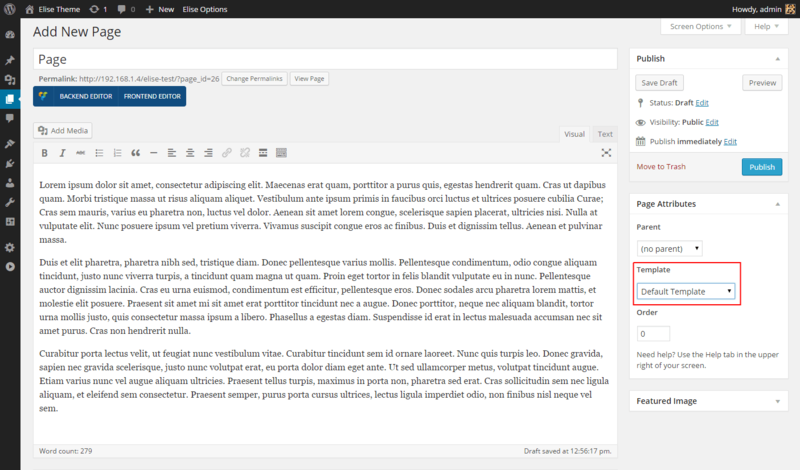 Elise Theme allows for advanced text editing with Formats in native WordPress WYSIWYG text editor. 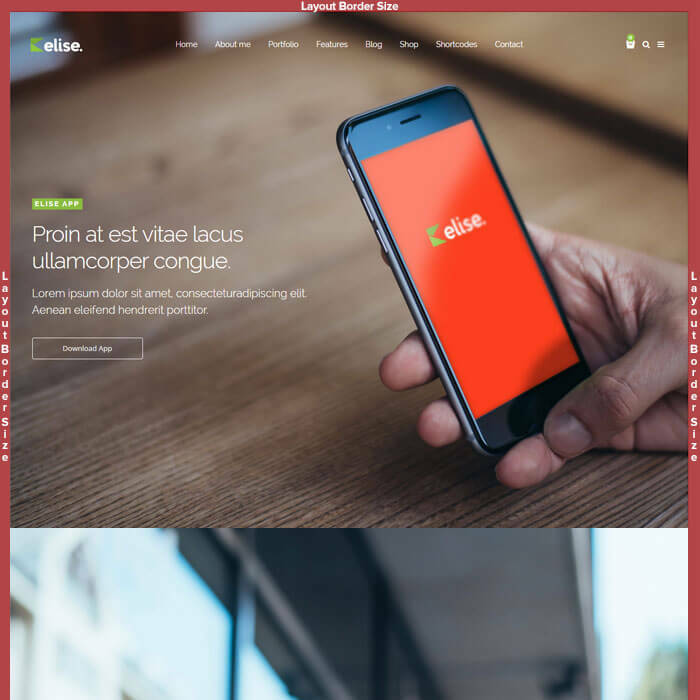 Elise Theme is fully responsive and mobile ready by default, but you can disable this function with one click in Theme Options -> Layout options tab. You can select one of two mobile navigations. Live examples here..
You can also create and assing custom - "simplier" menu for mobile devices or set same as Main Navigation. Read more. Elise is Retina Ready so it means that theme will look fantastic on High Resolution displays like the iPad or iPhone Retina devices. 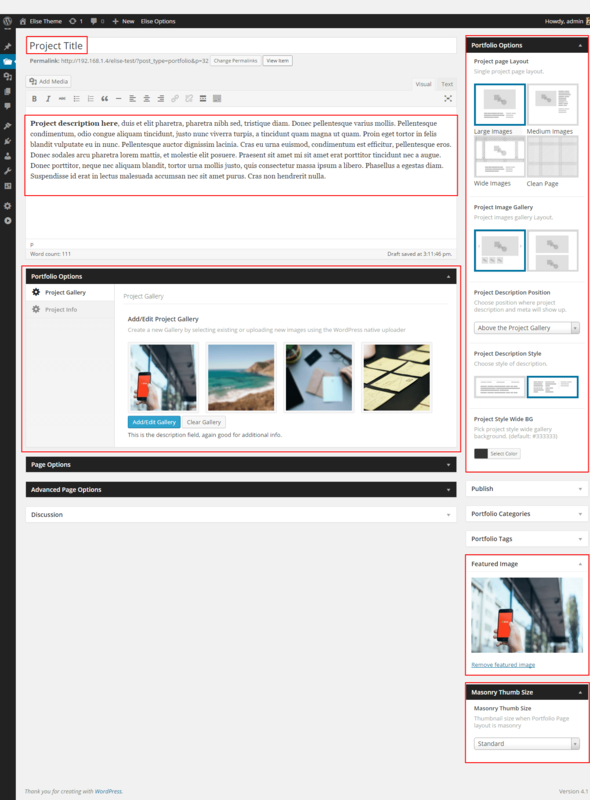 Blog, Portfolio Thumbnails and Project Gallery Images will be generated automatically to Retina display. All you need to do is upload image with resolution big enough to generate @2x image. For example if your project image size is 1176x700 you should upload image with atleast twice bigger than original resolution - 2352x1400 pixels. Other Images like Logo or Favicons.